Don’t most of us (if not all) sit down and wonder sometimes if we are making any real difference in the world? Perhaps it is the never-ending winter this year that has brought on the blahs to almost everyone I have bumped into lately…all admitting that their work and leisure have suffered as a result of the endless gray purgatory. The biggest lament is not the cold…but the lack of sun. For me…it isn’t until a few days have passed (without being able to go out in my garden and feel the sun on my face) that I begin to acknowledge the importance of the sun’s beneficial and healing rays on my mental and physical condition. It slowly starts to affect attitudes and aptitudes that we take for granted. Negative thoughts start to penetrate our psyches and we started reading things into, otherwise, positive habits in our lives. For example, writing is so ingrained in my psyche, if a few days go back without writing…my life starts tilting off-balance…going askew. The only thing to “right” it is to start writing again. I am so tuned into my computer, desk, the books gathered around it…that any thing amiss throws me off-kilter and I can’t resume writing until the missing item is back in place. 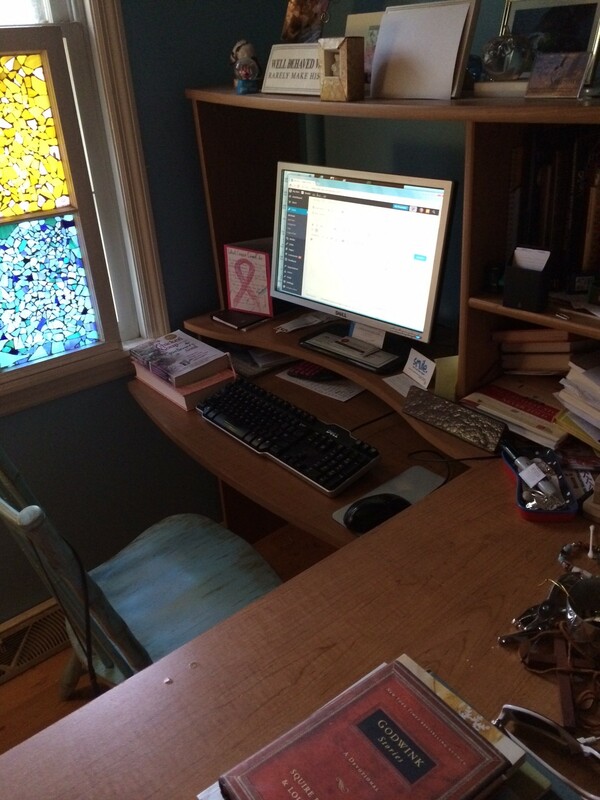 Before I enter my “writing sanctuary” each day to begin the next day’s blog…I take a moment to stare at the empty chair and the black screen on the computer. If I never typed another word on the computer…it would remain dark. Life would go on certainly… but my piece of the life puzzle would never be complete…leaving one small voice silent in the dark abyss of space. But the stars would recognize the void…a smattering of stardust would dissipate. We are all connected to each other and to every component of life as we know it…and don’t know it. By talking ourselves out of our place, our importance in the universe, we run the risk of setting off a chain reaction of negativity that could circle the globe. What if everyone, on the same day, decided that what they contributed to the world was worthless (too little to count or matter) don’t you think chaos would ensue? Teachers, doctors, artists, writers, builders, spiritual leaders, construction workers, etc. all quitting the world simultaneously. I am sure you have noticed that my readings have brought me back to Madeleine L’Engle as of late. I do have a tendency to settle on a particular author during certain stages of life…and obviously I am in an L’Engle period right now. “It is through the gifts of the Spirit that art comes, that love comes. But because we’re human, we’re never entirely sure. We know we haven’t served the work as well as we would want to. But if I had to serve the work to my satisfaction, I would still be on my first writing. And that would be pride. “I have never served a work as it ought to be served; my little trickle adds hardly a drop of water to the lake, and yet it doesn’t matter; there is no trickle too small. Over the years I have come to recognize that the work often knows more than I do. And with each writing I start, I have hopes that I may be helped to serve it a little more fully. Each day before I type the first word…all preconceived ideas of the blog content (for the next day) fly out the window and my fingers just start typing. It truly is the “Gift of the Spirit” as to where and how the writing goes on any particular day. Like Picasso…I feel the need to share my thoughts and hope that others share similar introspections…. (or simply want a good laugh at that crazy gal from Summerville…and that’s okay too!) The world can always use another laugh or two. Every droplet of water contributed to us on this planet serves mankind when multiplied by all the other droplets forming daily. Every time one of us decides “we aren’t worthy” and stops feeding the lake with our unique talent/our droplet… then the lake (the world) diminishes one drop at a time. 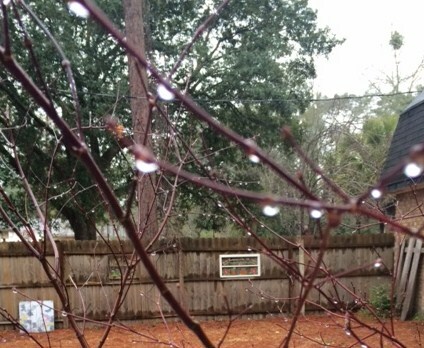 So until tomorrow…gray skies or sunny…Let us remember that no one else, but ourselves, can contribute the single drop of water to the lake… that we can. The size of our contribution makes no difference to the outcome… It is just the fact that, as long as we are alive, we are still contributing to the water of life… for all to drink. 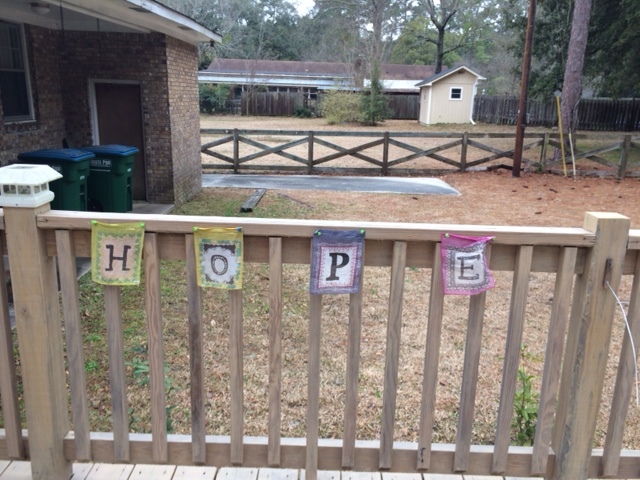 * When I went outside yesterday to take a photo of the gray, cold, dreary day….I turned around and there were my four lettered pieces of cloth (a little soggy) but hanging in there with HOPE. 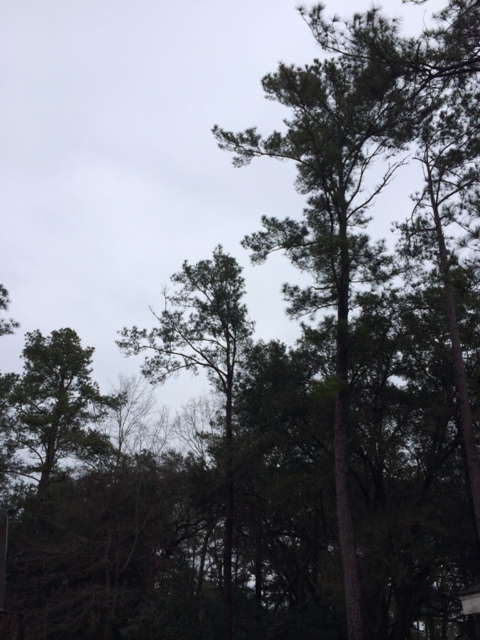 The sun will come out ….’maybe or maybe not tomorrow’….but one day! Keep “feeding” Becky….YOU are making a difference! Mary! How wonderful to hear from you! I have missed you. If you have a few minutes please email me (rebecca_dingle@hotmail.com) and catch me up. Want to hear about your family and how things are going for you!